Seeking a way to confirm that patients have taken their medication, University of Florida engineering researchers have added a tiny microchip and digestible antenna to a standard pill capsule. The prototype is intended to pave the way for mass-produced pills that, when ingested, automatically alert doctors, loved ones or scientists working with patients in clinical drug trials. “It is a way to monitor whether your patient is taking their medication in a timely manner,” said Rizwan Bashirullah, UF assistant professor in electrical and computer engineering. Such a pill is needed because many patients forget, refuse or bungle the job of taking their medication. This causes or exacerbates medical problems, spurs hospitalizations or expensive medical procedures and undercuts clinical trials of new drugs. The American Heart Association calls patients’ failure to follow prescription regimens “the number one problem in treating illness today.” Studies have found, for example, that patients with chronic diseases normally take only about half their prescribed medications. According to the American Heart Association, 10 percent of hospital admissions result from patients not following the guidelines on their prescriptions. Other studies have found that not taking medication properly results in 218,000 deaths annually. So-called “medication compliance” is a big problem for clinical trials, Bashirullah said, because failure to take experiment drugs skews studies’ results or renders them meaningless. As a result, researchers often require visual confirmation of participants taking pills, an extremely expensive proposition if hundreds or thousands of people are participating in the trials. “The idea is to use technology to do this in a more seamless, much less expensive way,” Bashirullah said. Bashirullah, doctoral student Hong Yu, UF materials science and engineering Professor Chris Batich and Neil Euliano of Gainesville-based Convergent Engineering designed and tested a system with two main parts. One part is the pill, a standard white capsule coated with a label embossed with silvery lines. The lines comprise the antenna, which is printed using ink made of nontoxic, conductive silver nanoparticles. 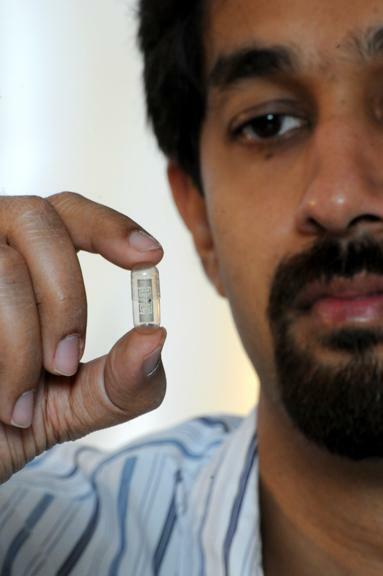 The pill also contains a tiny microchip, one about the size of a period. When a patient takes the pill, it communicates with the second main element of the system: a small electronic device carried or worn by the patient – for now, a stand-alone device, but in the future perhaps built into a watch or cell phone. The device then signals a cell phone or laptop that the pill has been ingested, in turn informing doctors or family members. Bashirullah said the pill needs no battery because the device sends it power via imperceptible bursts of extremely low-voltage electricity. The bursts energize the microchip to send signals relayed via the antenna. Eventually the patient’s stomach acid breaks down the antenna – the microchip is passed through the gastrointestinal tract — but not before the pill confirms its own ingestion. “The vision of this project has always been that you have an antenna that is biocompatible, and that essentially dissolves a little while after entering the body,” Bashirullah said. The team has successfully tested the pill system in artificial human models, as well as cadavers. Researchers have also simulated stomach acids to break down the antenna to learn what traces it leaves behind. Bashirullah said those tests had determined the amount of silver retained in the body is tiny, less than what people often receive from common tap water.